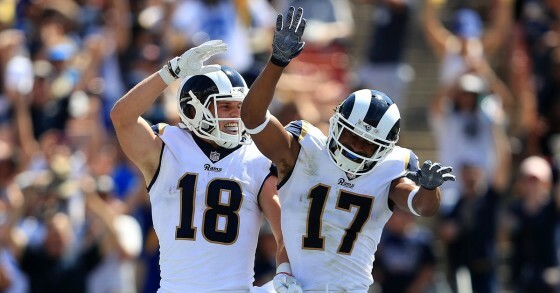 Tag Archive | "2018 NFC West Preview"
It’s hard to see a scenario in which the Rams are not serious contenders this year. There has been some concern about all the personalities they acquired fitting in; however, there is too much talent on this team. The offense should be even more prolific this season with the addition of Brandin Cooks at wide receiver to take the tops off of defenses. Opposing teams will have a hard time loading the box to stop Todd Gurley and expect over 1,500 rushing yards from Gurley this year. This offensive line lead by Andrew Whitworth and John Sulllivan (left tackle/center) is very underrated and allows Jared Goff to be comfortable as he continues to develop as a pro. Defensively, this team could be incredibly dynamic. Aaron Donald is likely the best defensive tackle in the league and now that he is partnered with Ndamukong Suh, teams will have a nightmare controlling them up front. Marcus Peters may have had locker room issues in Kansas City but, outside of Jalen Ramsey, he is probably the best corner in the league. Paring him with Aqib Talib means receivers won’t come open, and Donald and Suh will either get to the quarterback or draw the attention for others to do so. Sometimes, all this talent added doesn’t always mesh and that is a possibility. I think there are just too many good players for this team to not be dangerous. A lot of excitement in the Bay Area with Jimmy Garoppolo set to be under center for the full season. I know Garoppolo has not lost in his career, and I expect him to make serious contributions in this league in the future. I just don’t see it being this season. Jerick McKinnon is now done for the season, so Matt Breida will have to carry the bulk of the running game responsibilities. And, I’m not sure about him with that workload. Joe Staley is still a quality left tackle, and I like the addition of Jonathan Cooper at guard. First round pick Mike McGlinchey at right tackle really solidifies this line. I’m not all that sold on the receivers. Pierre Garçon is reliable and Aldrich Robinson can stretch a defense, but I think they need a more consistent explosive target. Defensively, they have a chance to be solid on all three levels. Solomon Thomas should start becoming a game changer at defensive end, Rueben Foster might be the best middle linebacker in football, and Richard Sherman has been the best in the business. If Sherman is back from injury completely, their defense can be dangerous. Garoppolo is not going to go undefeated in his career though, and I see the Niners falling just short of the playoffs. I see the Seahawks begin their downslide this season. As good as Russell Wilson is, I just don’t know how much more of a burden he can continue to carry keeping them competitive. They have Duane Brown at tackle for the full season and acquired D.J. Fluker (guard) as well in an attempt to solidify that line. They will be better but not great. Chris Carson showed flashes running the ball last year, and he will have to solidify the running game for them to have any chance. The defense which had been their calling card with the ‘Legion of Boom’ has been diminished. Indications are Earl Thomas is staying in Seattle, but they did lose Richard Sherman in the offseason though. Secondary coach Chris Richard is also now in Dallas as well. Byron Maxwell has done nothing but disappoint since leaving Seattle. Let’s see if he can find his game again back home. They are solid at linebacker with Bobby Wagner, K.J. Wright, and Barkevious Mingo who are all good pros. It’s tough to sustain winning in the NFL, and Seattle should start to experience that this season. It looks like Sam Bradford will get the starting nod at quarterback, replacing the retired Carson Palmer. Bradford has put up numbers throughout his career, but all in all has been a disappointment for being a number one overall pick. Arizona is solid in the middle of their offensive line. Mike Iupati is a top guard when healthy, A.Q. Shipley is a quality center, and Justin Pugh is a veteran who knows how to play. I like the addition of Brice Butler to alleviate some of the coverage off of Larry Fitzgerald, and a healthy David Johnson is a dynamic playmaker out of the backfield. It leaves one to wonder why rookie Josh Rosen is not getting the start, because there is a good foundation in place. On defense, Robert Nkemdiche has not lived up to the hype at tackle and really never even lived up to it in college. I’d like to see how Hasson Reddick adapts to moving down from safety to linebacker. Of course, Patrick Peterson will be his usual lock down self at corner and will be in contention for an All-Pro Team. I expect this team to struggle early, and Rosen to get the start sooner than later. If he comes in and shines before it’s too late, they could be a potential dark horse, I just don’t expect a rookie to be able to save a sinking ship.